MUMM-RA raises the MUTANTS’ buried spaceship from beneath the Desert of Sinking Sands. 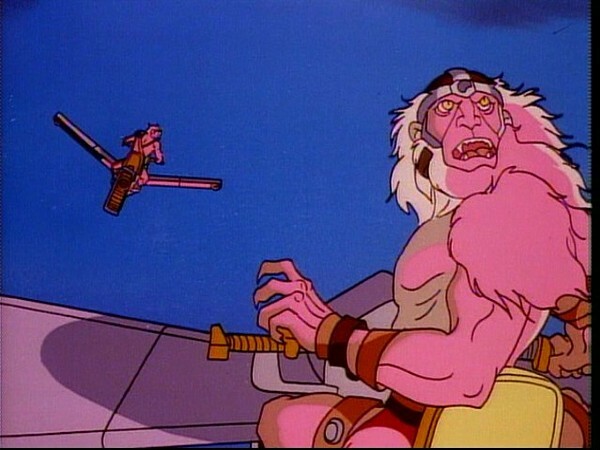 The MUTANTS regain their superweapons (SkyCutters and NoseDiver flying machines) and attack the THUNDERCATS. 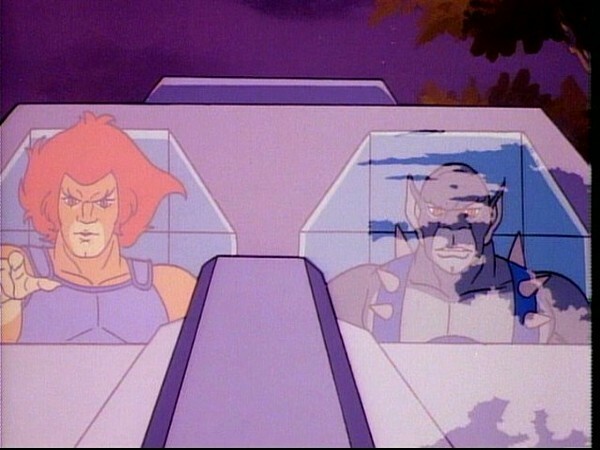 LION-O and PANTHRO pursue the NoseDiver underwater with the ThunderTank. They encounter a GIANT EEL and, with the help of parent SEA-QUINES, they rescue a baby SEA-QUINE pinned beneath the tank. The MUTANTS are defeated, but retain their super vehicles and return to MUMM-RA’s tomb to plan a next assault. In the midst of a struggle with the Mutants, a baby Sea-Quine’s life is endangered when it becomes trapped beneath the ThunderTank. 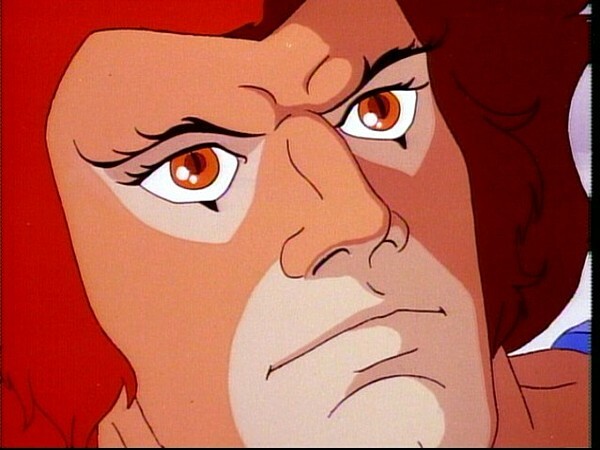 Despite the risk of losing the ThunderTank, Lion-O and Panthro work feverishly and cleverly to save the Sea-Quine. Their efforts in response to the danger of a loss of life show respect for the value of life. Their actions and sentiments stand in contrast to and offer a reply to a question raised by the materialistic Tabbut early in the episode, “What good is my life without money?” Life itself has an intrinsic value and it is to be fostered and protected assiduously. 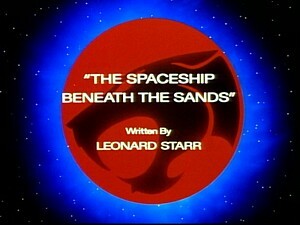 “The Spaceship Beneath the Sands” is a very interesting episode, in many ways something of a paradox. 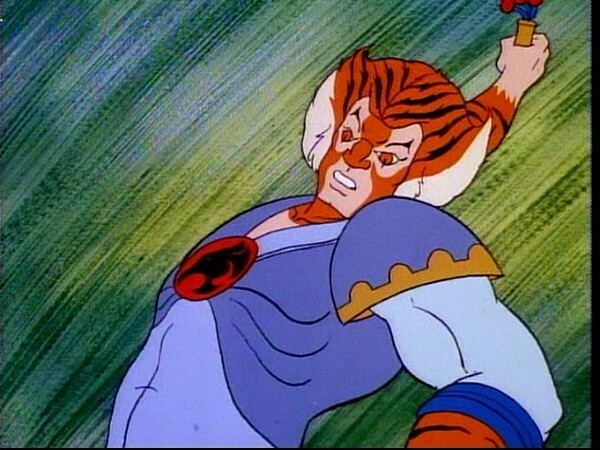 On the one hand this episode showcases a particular event, namely the resurrection of the Mutants’ technology and vehicles, that affects greatly the balance of power between the ThunderCats and their adversaries; yet on the other hand the plot for this episode is quite basic and, it could be argued, somewhat unspectacular. However, where this episode scores is in some of the subtlety of its writing, in particular the exploration of the relationship between Mumm-Ra and the Mutants. However, before touching on what makes this episode so interesting, let’s get the biggest negative out of the way. Although the animation on this particular episode is good, in my opinion it’s not up to the same standard as the episodes that have preceded it, often looking quite flat and uninspiring. There are some great shots contained within (particularly of Mumm-Ra), but for the most part the animation is slightly uninspiring. The style of animation shown in this episode would feature again in other episodes further on in the series, but is in the main very different from the overall look of the rest of the series in a way that is difficult to describe and yet obvious to the eye. 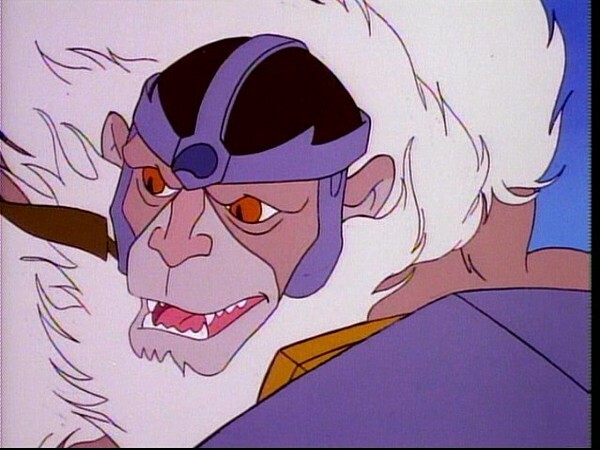 Looking past that, this is an episode brimming with subtle and interesting character writing for the characters perhaps most overlooked in that department throughout the course of the series, namely Mumm-Ra and the Mutants. In many ways this episode is very much a sequel to “The Unholy Alliance”, addressing as it does the same underlying theme (the relationship between the Mutants and Mumm-Ra), and exploring those issues further. 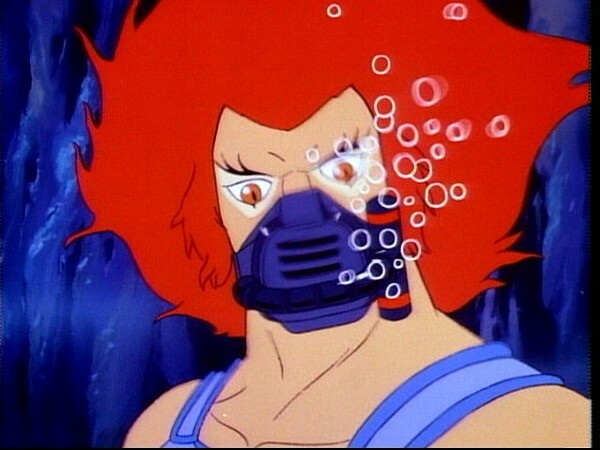 The episode begins by exploring a very realistic plot point, namely the fact that the Mutants are now at a serious disadvantage when taking on the ThunderCats: their feline foes were able to utilize their wrecked spaceship to build their ThunderTank and other such weapons, whilst the Mutants were denied access to the weaponry and equipment on their spaceship when it was sunk by Mumm-Ra. When the Mutants approach Mumm-Ra about this, the servile way in which S-S-Slithe requests the return of their spaceship is both a great insight into his cunning, manipulative Reptilian personality, and also shows just show beholden to Mumm-Ra the Mutants feel. 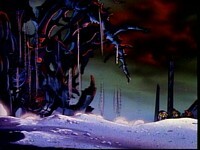 However, as the episode develops, S-S-Slithe questions why, if Mumm-Ra is indeed all-powerful, the devil priest has to return so frequently to his tomb to replenish his power, and by the end of the episode you see S-S-Slithe and the others blatantly defy their mummified benefactor by refusing to return their vehicles and equipment to their spaceship. 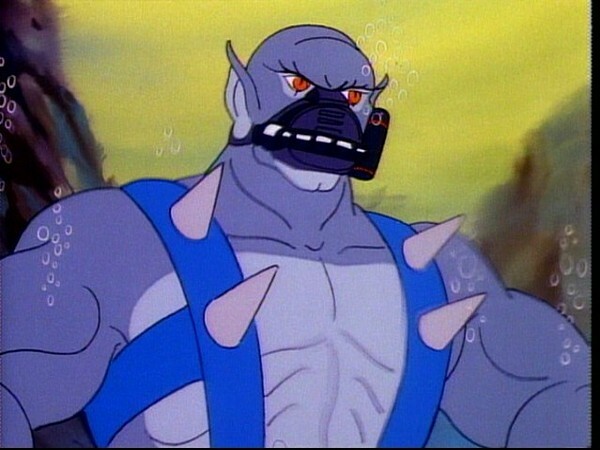 Whilst S-S-Slithe dresses this up by stating that he merely wishes the Mutants to be of better service, it’s clear that Mumm-Ra sees through this deception, yet for whatever reason chooses to ignore it. This represents a clear evolution in the relationship between the two parties, and whilst the Mutants would still continue to serve Mumm-Ra, watching this episode it’s not surprising that from this point on they were often shown to be rather more defiant and less in awe of him. 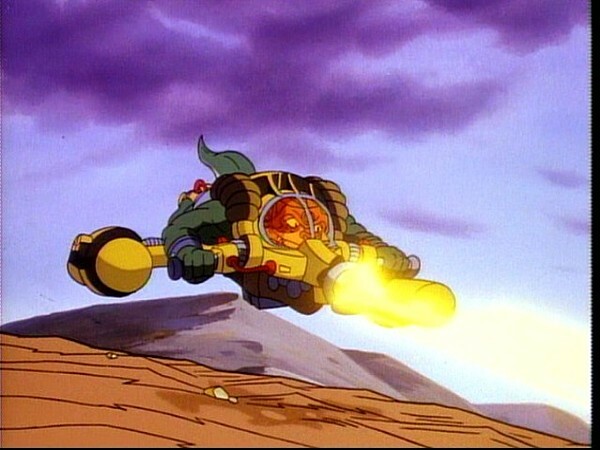 The introduction of the Mutants’ SkyCutter and NoseDiver vehicles is something that is very welcome, as it restores to the series a greater sense of threat—that the Mutants, even though still no match for the ThunderCats, are at least a tangible force in their battles. I have to say that I personally feel that the Mutants’ attacks with their vehicles in this episode could have been made to feel more of a threat and more dramatic. 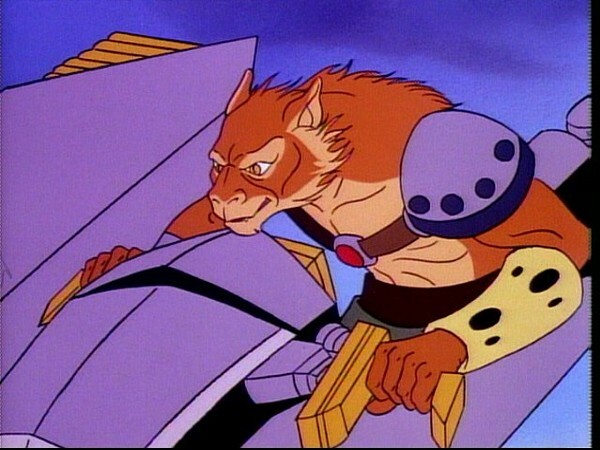 It would have been good to see the ThunderCats have to devise some form of weaponry or strategy to try and defeat these new vehicles, yet on their debut the Mutants’ vehicles are dispatched with relative ease. This rather defuses the threat that they pose and slightly negates the main plot behind this episode, which is basically a vehicle (if you’ll pardon the pun!) for introducing these new Mutant craft. When watching the introduction of these vehicles, I find myself comparing this to the introduction of Vultureman’s Flying Machine in “Lord of the Snows”. 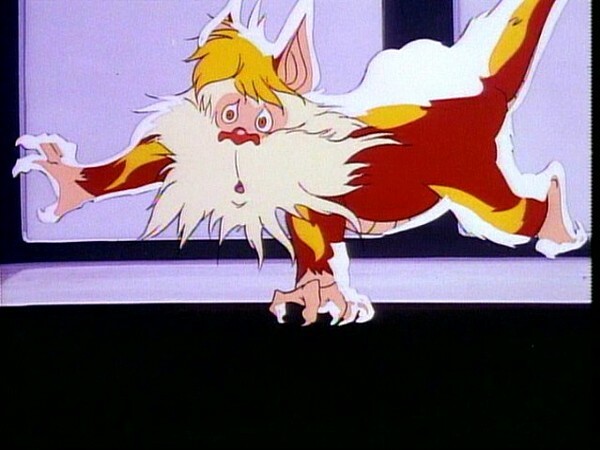 Although the Flying Machine is a somewhat less impressive vehicle, because of the dramatic circumstances surrounding its attack on Snarf and Snowmeow in that episode, somehow its entrance feels much more memorable. To summarize, this really feels like something of an underwhelming episode, one that is more essential to furthering the storyline of the series (courtesy of the introduction of the Mutants’ vehicles) rather than acting as a really standout episode in its own right. Nonetheless, as mentioned earlier it does feature some truly brilliant character writing between the Mutants and Mumm-Ra, and this alone for me makes it really worthwhile viewing. 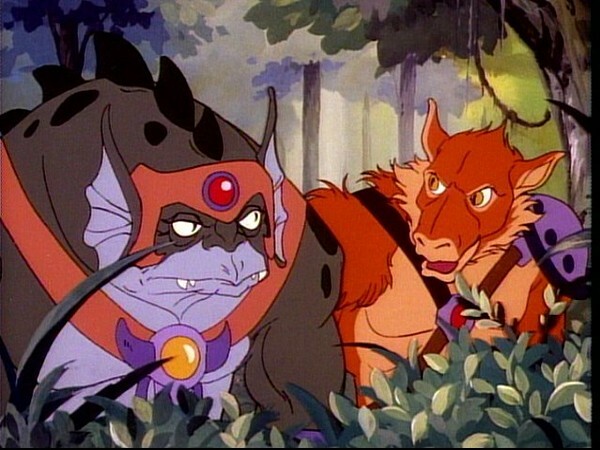 In this episode we are introduced for the first time to a Tabbut, a pig-like race of money collectors indigenous to Third Earth. 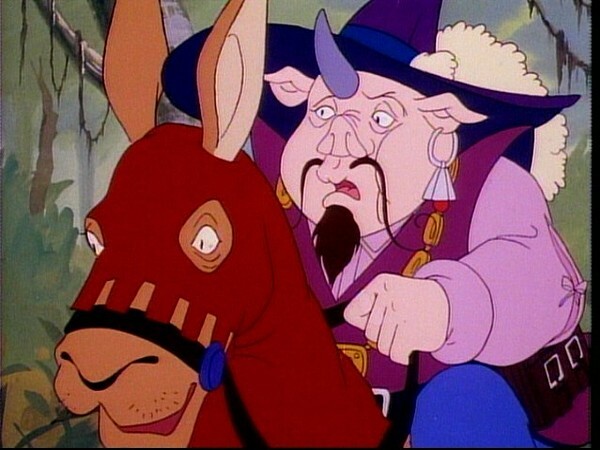 An interesting revelation in this episode is that the Tabbuts collect rent from the Wollos and Bolkins, although it is not established what this is in payment for specifically! This episode marks the debut of the Mutants’ vehicles, the SkyCutter and the NoseDiver. Although not introduced until this episode, early concept artwork exists that would suggest that the vehicles had been designed and planned to be included in the series at a very early stage. Despite his proclamation in “The Unholy Alliance” that the Mutants’ spaceship was “gone forever”, this episode features its resurrection—proof that you can never trust Mumm-Ra on anything! Following the introduction of the ThunderTank’s amphibious mode in “The Terror of HammerHand”, in this episode it is established that, when submerged on its back, the ThunderTank is rendered inoperable—a peculiar liability that rears its head again in “Return of the Driller”.